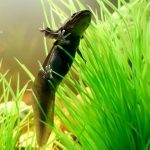 I really got into using Instagram last year, I started off with the intention of it being strictly work-related, but given the being that I am, there are the odd shots of other stuff too. I love the immediacy of posting pictures of what I’ve made, and how. I typically use it to show work in progress or just finished in a ‘warts and all’ unedited format. I occassionally (ok, often) post a picture of something that’s made me laugh or go ‘ooooh!’. I am trying to make my posts more professional, I *am* honestly, but I do get distracted. Anyway, last March was the first time I had a crack at the excellent #marchmeetthemaker Instagram challenge founded by Somerset’s Etsy Team Captain, the fabulous Joanne Hawker. 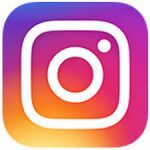 Instagram challenge rules are simple. For one month, you are given a series of daily challenges and post an image relating to each. I loved it for its simplicity, and for the way it made me think differently about what I was posting. 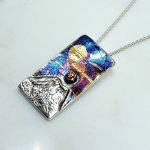 I also found myself checking daily what other people were posting, and it was great to see the range of makers, what was being made and how. It’s a great way of engaging with other makers, and craft lovers. When it was over I was genuinely a little bit bereft. A couple of weeks ago, one of our Cavetsy team members; Louisa of Baked By Lou was wondering if any Instagram challenges were forthcoming, and we had a general lament that there seemed none (or none relevant) to us at the mo. So we thought why not start one for October? 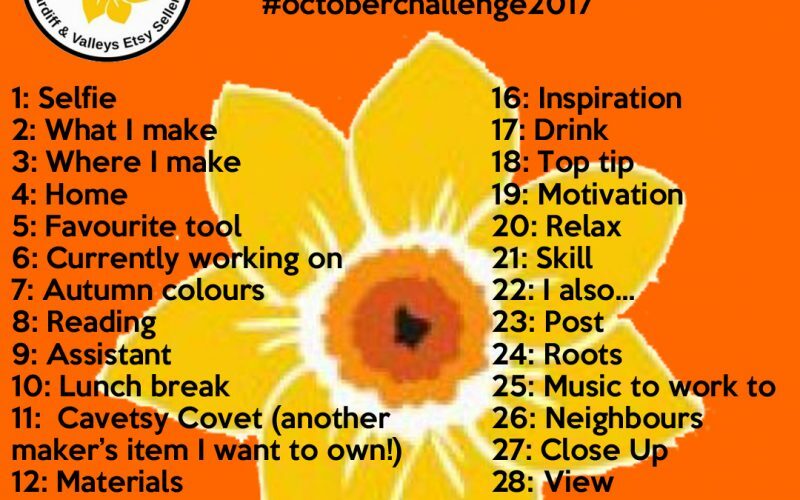 After a few hiccups (I kept insisting there were two 29ths of October), here is our October Instagram Challenge. 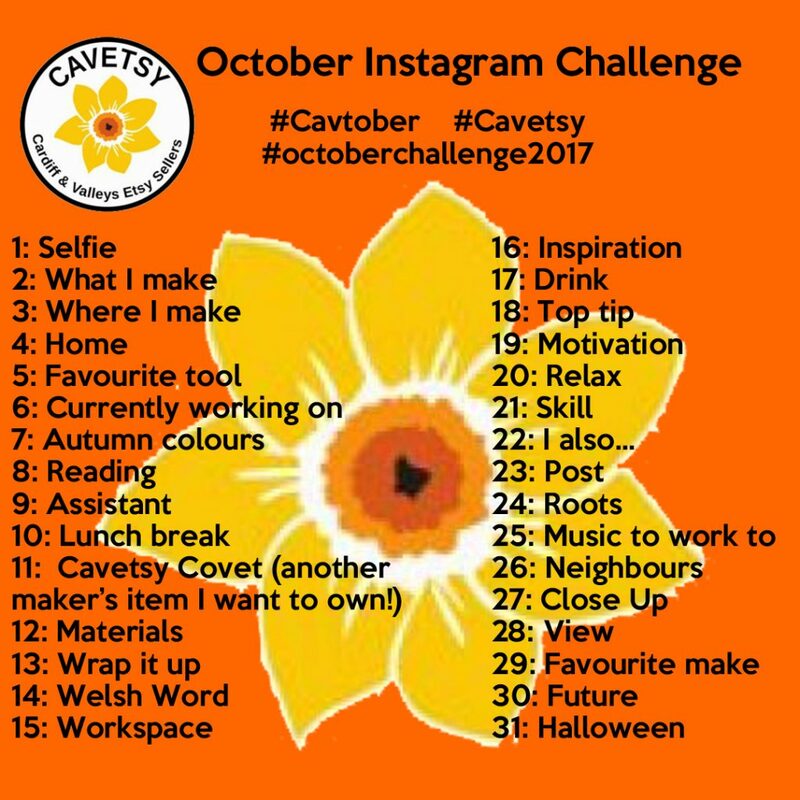 We’d love for you to join in (if you do please use the hashtags #Cavetsy #Cavtober #Octoberchallenge2017). You can interpret the daily challenges as you wish! For 11, to find out what Cavetsy members make, you can click here to search for us on Etsy, here for Instagram or check our site listings. Please get on Instagram, take part, share and celebrate what a creative, diverse and inspiring bunch we are! I’m looking forward to #Cavtober already!